No Sew Burlap Ruffled Runner Tutorial. 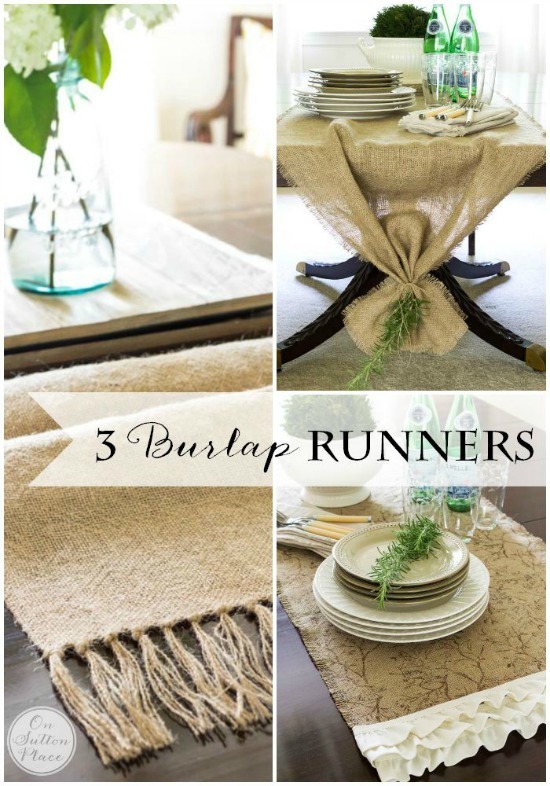 Easy directions to make a custom burlap table runner that requires no sewing. Uses ready-made ruffled trim. As one who loves to sew, I have found that sometimes adapting a project to make it “no-sew” is tricky. That’s not the case with this no sew burlap ruffled runner. Using a hot glue gun made putting this runner together quick and easy. I got the printed burlap at JoAnn, but it is no longer available. The measurements of my runner are 20 inches x 50 inches. You can, of course, make your runner any size you want. For this size, I would recommend getting 1 3/4 yards of burlap. Most likely you could get away with 1 1/2 yards but that would be cutting it close at 54 inches. When you prepare the burlap, you will lose a few inches on the ends because it gets shaggy. 1. Prepare your burlap. Here is my tutorial on How to Wash, Dry and Cut Burlap. After you have prepared your burlap, cut a piece that measures 20 in. wide by 50 in. long. These are basic start measurements. You can make your runner any size you want. On the long sides, pull out 6 strands to create a fringed edge. 2. Cut 6 pieces of ruffled trim in 24 in. lengths. Begin attaching the first length of ruffle with a hot glue gun. 3. Let the ruffled edge hang off the end of the runner to cover the raw edge. 4. Make sure to leave a 2-inch overhang on each side of the runner. Run a bead of hot glue along the runner and completely attach the first ruffle. Work in about 5-inch sections. 5. Using the same method, glue the second row of ruffles above the first row. 6. Repeat again for the third row. Now rotate your runner and glue 3 rows of ruffles to the other end. 7. Turn the runner over so the back side is facing up. Trim the ends of the 3 rows of ruffles so they are even, 1 inch from the edge of the runner. 8. Glue the ends down so they are neatly attached to the back side of the runner. 9. Repeat steps 7 and 8 for the other end of the runner. Press well. This does not have to be exact or perfect. The ruffles are very forgiving so if they are a bit wavy don’t worry about it. You can switch this up by adding more rows or using a wider ruffled trim. 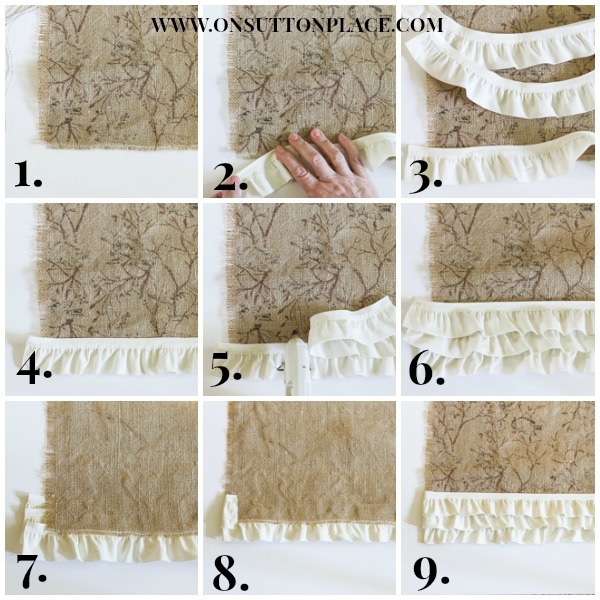 Use this no sew burlap ruffled runner tutorial to make a custom runner that reflects your own personal style! Click the image below for more easy table runners! Wishing you all an amazing week…see you soon! Do you follow OSP on Pinterest? Ann, I love the runner, but the major thing about it that I love is the printed design so I am super disappointed that it’s not available. Is it just JoAnn’s that doesn’t have it anymore or could it be found elsewhere? I was thinking of making it for the top of my old oak upright piano and making fringe on the ends instead of the ruffle. Thanks for the great idea. Maybe I could stencil on the burlap to create a similar design. I just tho’t of that! I looked online at several fabric stores and could not find anything even remotely similar. I’m sorry! 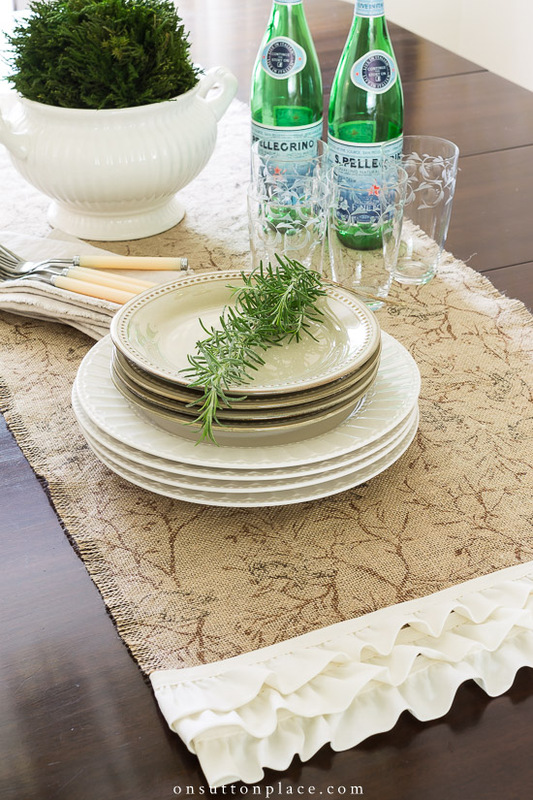 Love an easy project.The runner looks beautiful on your table. Thanks for the tutorial. This turned out really cute. I have a piece of burlap that I put under the Christmas tree last year and would like to use it for a runner. I got it out of my closet and placed it on the bottom shelf of my cart that I am using as a work station for my fall decorating. My cat seems to like laying on the burlap because every time I go to start to make my runner, he is napping on it and I don’t want to disturb him. Maybe I will have to buy more burlap! I love the washing of the burlap. I’ve wanted to use it, but it’s so stiff and smelly. Thanks for sharing these amazing tips. I also love the tied version of the runner. Very artsy! I love this burlap runner – just a couple of questions though – first where do you find printed burlap and secondly and this may sound strange but does the burlap have an odour. The reason I ask is that I purchased a burlap runner off an Etsy site 2 years ago and I had to wash and wash and wash it before any of that awful burlap smell would start to soften. Thanks and again love the one you showed. I like this project. I’ve looked all over for that printed burlap fabric because I want it—-BAD! Anyone know where I can get it? Hi Sonya! I got the printed burlap at JoAnn Fabric. Thanks for stopping by! Ann – I always look forward to your printables & I hope that’s what you are going to be doing. Ann, I noticed your new font on your pinnable image immediately! LOVE it and the runner as well. I almost purchased a fall runner at Hobby Lobby but hesitated. Now I can make my own! Thank you sooooo much! Pinning! You are making me rethink my lack of appreciation for burlap. You make it look so pretty I may have to give it a whirl, maybe using your techniques will make it more enjoyable for me. I have seen some burlap that is hand painted and the texture gave it such a gorgeous vintage look. I hear you Pamela! I was a burlap skeptic too. Give it a try! Pretty! I have a round table but love this idea. How beautiful! 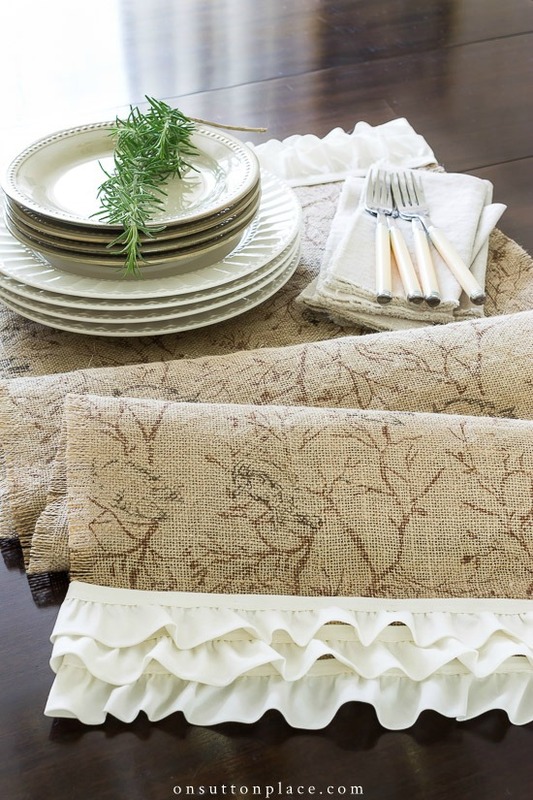 I love the white ruffle with the rough burlap, and the pattern on the burlap – oh you are so creative!! Ann, I love love love this! Your fabric is gorgeous! I’m going to have to make this for my kitchen table. Thanks for the wonderful tutorial! I always question how long to make the runner, it looks like yours is just short of the length of your table. Is that right? Thank you, this is something I’m going to try soon! You can make your runner any length you want really…but I think if it measures 5 or 10 inches from each end of the table it’s perfect! This is so sweet and just right to go from summer into fall! I just love this -saw it on Facebook earlier. Might have to get out of the garden and do something like this for fall. Thanks for the detailed instructions. Thank you for coming over from Facebook…it totally made my day! 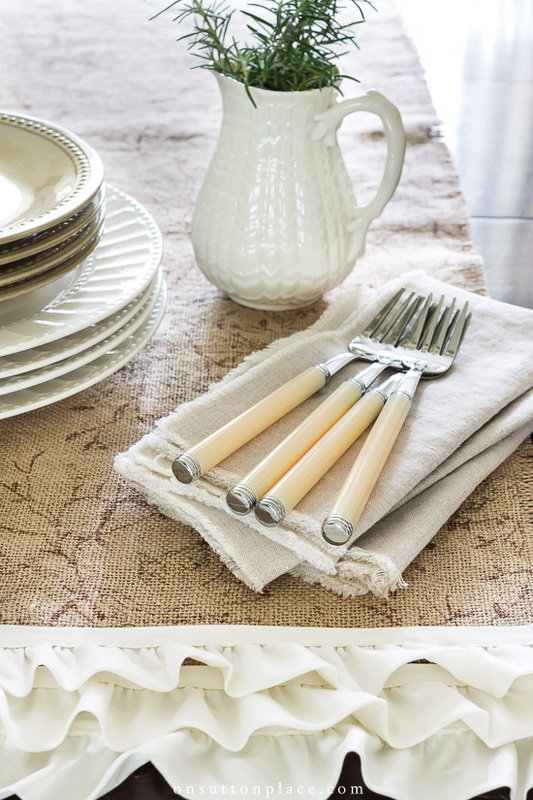 Cute table runner…great for Fall! So pretty! Where did you find that cute bird printed burlap? Love the look of it all! What a wonderful runner! And no sew to boot….perfect!